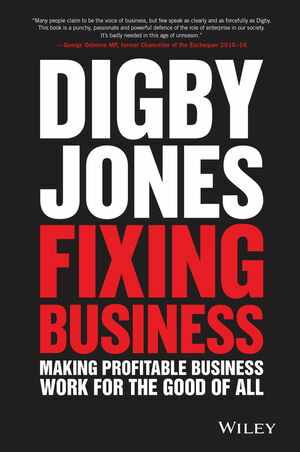 In his second book ‘the face of British Business' Lord Digby Jones shows us why profit isn't a dirty word—it's what you do with it that counts. Society is at a crossroads, and good business lays the foundation for a successful future; but are we brave enough to build it? Fixing Business focuses on why we must be. Fixing the world requires a vibrant and successful, profit-yielding, tax-delivering, job-creating business sector. This book describes how that sector is built, and how the good of business means the good of all. From the smallest shop around the corner to the largest multinational corporation, the variable upon which every facet of business success rests is people. Workers, investors, customers, creditors—all ensure that wealth is created, and at the end of the day, they are what business is about. Fixing Business shows us how to harness their power to change the world. Lord Digby Jones served as Director General of the CBI (Confederation of British Industry, the UK's Voice of Business) from 2000 until 2006. In2006 he became the UK Skills Envoy and in 2007 he was appointed Minister of State for UK Trade & Investment. He did not join the party of government and without ambition to progress in politics he concentrated on the business of promoting Britain across the world, traveling to 31 countries in 45 overseas visits.Born in Birmingham, Lord Jones originally joined the Royal Navy, before graduating from University College London and joining the law firm Edge & Ellison, rising from Articled Clerk to Senior Partner. In 1998 he joined KPMG as vice-chairman of corporate finance, before taking up his role at the CBI. In 2005 he was knighted for his services to business and became Sir Digby Jones in The Queen's New Year’s Honours List. In 2007 he became a life peer taking the title, Digby, Lord Jones of Birmingham Kt. Today Lord Jones sits as an active cross-bencher in the House of Lords and is an official United Kingdom Business Ambassador. He speaks regularly to business audiences both in the UK and overseas. He serves in the private sector as Chairman of the international Business Advisory Boards of HSBC and British Airways, a Corporate Ambassador for Jaguar Cars and JCB, and Chairman of Triumph Motorcycles, among a number of pair and unpaid roles. He holds a number of charity positions, is a non-executive director of Leicester Tigers Rugby and lives with his wife Pat in Marylebone and Warwickshire. Please include the below CIP data to the copyright page for the next reprints. Names: Jones, Digby, 1955- author.